For some reason or another spring is an ideal time to do some cleaning. Many of us choose to start with our closets by storing all our winter gear away. Others prefer to add some colorful accents to their home to celebrate the coming of spring. However, one thing we should all be doing is spring cleaning our car. 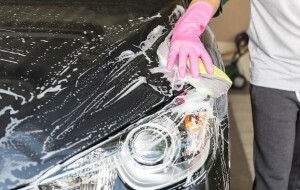 A clean car is a safer place and has a higher trade-in value (if you’re planning on selling it). Giving it an exterior wash once in a while just isn’t enough. Take advantage of the longer and warmer days to do some deep cleaning for your vehicle. Here are some things you should do to get your car ready for the coming warmer months. By insides, we don’t mean the cabin interior, but the engine and all other systems that make your car run. A good tune-up and some maintenance can get your car in top shape and even help it be more eco-friendly. Winter roads tend to be more slippery which can take a toll on your brakes and tires. Check your tires tread depth if it’s too worn out you might have to replace your tires. Otherwise, make sure that the air pressure is as it should. As for your brakes, you might need to refill the brake fluid along with the other fluids that keep your car in motion. Test your battery to make sure it’s clean and has enough power. You’re going to be using your air conditioner more these coming months, so be sure it’s working correctly. You can even change the air filter to prevent dirt and pollen from getting inside de cabin and affecting your health. Lastly, you’re probably due for an oil change sometime soon, be sure to get an AMSOIL Synthetic Oil change. You can purchase their Signature Series 10W-30 Synthetic Motor Oil or any other lubricant your car needs online or by calling North American Wholesale at (866) 580-1008 to place your order. For many of us, our car is more than just a vehicle. It can serve as a lunch area, a resting place, and even a closet. Many of us are guilty of leaving food crumbs, food wrappers, empty bottles, clothes, and other random stuff lying around in our vehicle. Unintentionally, all that unnecessary excess weight is raising our fuel expenses. Start by clearing out all the trash and everything you don’t absolutely need to bring with you. Once everything is out, vacuum the carpet mats and underneath them, as well as your seats. If you own leather seats, wipe them down with a damp rag. If there are some areas in your car that your vacuum cleaner can’t reach, use compressed air. Use a wet cloth to clean the dashboard be careful not to get any water into the electric systems. If your pet constantly travels with you regularly, try pet-proofing your car. Place an air freshener, and you’re good to go. Dead leaves and bugs might be stuck to different areas of your vehicle. It’s time to clean them off. Give your car a good wash using some mild soap. Once your car is dry, you should give it a wax to add some shine. Try to wash and wax your car away from direct sunlight. Be sure to use wax that’s compatible with your car’s paint. Changing our wiper blades is not the first thing on our list. Wiper blades should be replaced twice a year if you expect to have a clean windshield year around. With spring showers coming up ahead you will need full visibility. If your blades are cracking, smearing your window, or making annoying noises, you will need to get a new pair. Get your car ready for warmer days by getting an AMSOIL Synthetic Oil change. Switching to synthetic oil is one of the best things you can do for your vehicle and its performance. Remember you can purchase all your supplies including the Brake Fluid and Coolant you’ll most likely need at AMSOIL’s online store. You can also call North American Wholesale at (866) 580-1008 to make your purchase and get some special recommendations.